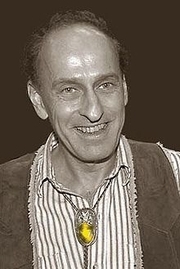 Roger Joseph Zelazny was the only child of Polish immigrant Joseph Frank Żelazny and Irish-American Josephine Flora Sweet. In high school, he became the editor of the school newspaper and joined the Creative Writing Club. In the fall of 1955, he began attending Western Reserve University and graduated with a B.A. in English in 1959. He was accepted to Columbia University in New York and specialized in Elizabethan and Jacobean drama, graduating with an M.A. in 1962. Between 1962 and 1969 he worked for the U.S. Social Security Administration in Cleveland, Ohio and then in Baltimore, Maryland spending his evenings writing science fiction. On May 1, 1969, he quit to become a full-time writer. Zelazny was married twice, with three children. At the time of his death, Roger was separated from his wife and living with author Jane Lindskold. Roger Zelazny's book L. Ron Hubbard Presents Writers of the Future 35 is currently available from LibraryThing Early Reviewers. Roger Zelazny is currently considered a "single author." If one or more works are by a distinct, homonymous authors, go ahead and split the author. Roger Zelazny is composed of 39 names. You can examine and separate out names.